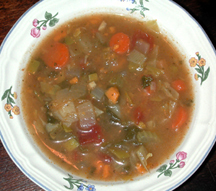 This week, we are serving the original Caring Cuisine entree – Simply Veggie Soup . So many veggies and so few calories! The ingredients include: rutabagas, squash, sweet potato, onions, leeks, carrots, tomatoes, kale, cabbage, celery and some secret herbs n spices. And its less than 100 calories per serving. 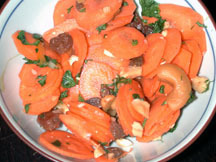 A wholesome Karmic Karrot Salad will go nicely with the soup. It’s naturally sweet from the carrots, with a nice sweet dressing (no mayo!). Flavor is added with cashews and currants. It’s one of my favorites! 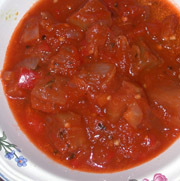 Please enjoy our Red Pepper n Eggplant Chowder. It’s so refreshing, exotic, and nutritious! I love the lemon zest and Mediterranean flavors. It is also less than 100 calories/serving. In addition and by request, we are offering our yummy Mediterranean Lentil Salad for a command performance. A refreshing salad filled with protein, good fiber and delicious seasonings. The lentils are mingled with carrots, bell pepper, red onion, scallions, and parsley in a tasty tangy dressing. You won’t be disappointed. Feel like a dip? It’s time for our homemade Spicy Hummus!. It’s a favorite and only for those who can handle the spicy flavor. Served with a stack of celery, it makes for a flavorful and healthy snack filled with fiber, protein and joy. Our salads are fresh, seasonal, and diversified with a variety of veggies, protein, fiber and flavor! So fresh, they are only available for delivery/pickup on Mondays and Wednesday! Featured this week is our Original Garden Salad. This week’s salad includes: romaine, sunflower seeds, home-cooked beans, carrots, berries/apples, celery, tomato, red onion/parsley/cucumber, and a home-made basalmic vinaigrette. 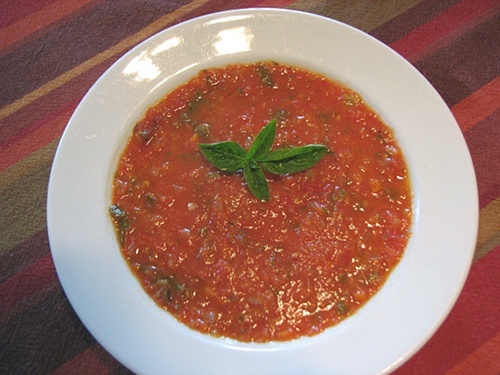 Try this special soup: Zucchini n Tomato Soup It’s got an italian zip, with more! A thick soup with pureed zucchini and onion, a richness from a bit of chicken Italian sausage, and filled with many extra tasty veggies. It’s like minestrone without the beans or pasta (which means its good for the gluten/legume sensitive folks out there). About 140 cals per serving. 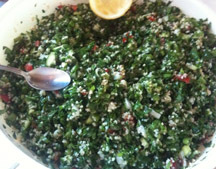 Oohhhhh we love Taboulhee and hope you do too. This is the labor of love to pick and finely chop a bushel of parsley to create this extremely refreshing and cleansing salad. We add some mint, green onion, tomato, lemon and a dash of bulgar. It’s a favorite so get your order in early! A light asian-flavored Bean Sprout Salad is always a good side dish. Includes sesame oil, rice vinegar, green onions, toasted sesame seeds, slivered red pepper, and of course, blanched bean sprouts. I hope you enjoy it! Feel like a di p? If you can handle the intensity, we have our homemade Breadless Brushetta ready for you! Fresh tomatoes, basil, capers, and more. Served with a stack of zuchinni chips, it makes for a flavorful and healthy snack filled with joy. Our salads are fresh, seasonal, and diversified with a variety of veggies, protein, fiber and flavor! Featured this week is our fresh Italiano Salad. Available for delivery/pickup on Mondays and Wednesday to ensure freshness! 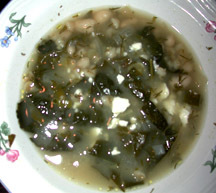 It includes white beans, pepper/parsley/onion, olives, pepperchinis, celery, marinated artichoke, and Parmesan cheese, with a home-made low-cal Italian dressing. I’m trying a new recipe; ready to test it out with me? A nice gormet Chunky Tomato n Basil Soup. No need for cream in this soup, it will be pureed with bits of tomato, onion and strips of basil. Even better, it’s less than 90 calories a serving. 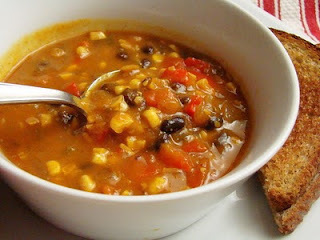 With a soup as lean as that, we can afford to enjoy some Black Bean Salad. 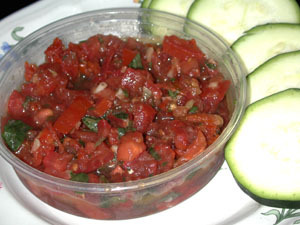 This can be eaten as a stand alone salad or as a salsa-like dip. A refreshing change from the cheese n bean dip from college days. Flavors include: black beans, corn, bell pepper, tomatoes, onion, pineapple and jalapeno with a sweet, smokey chipolte dressing. The nutritious fibrous beans make this about 180 calories/serving. 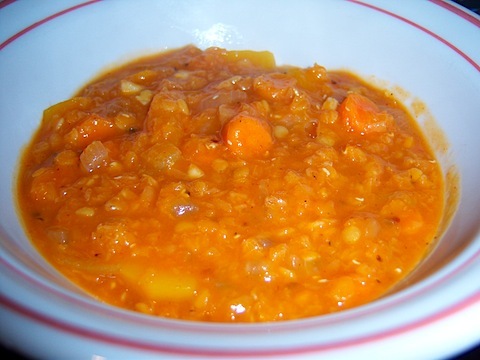 Later in the week, there is more flavor to come in our Red Lentil Soup. Filled with curry and coconut flavors with butternut squash, sweet potato, and mushrooms. It will put a smile on your face and another smile in your tummy. 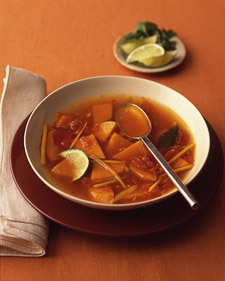 This hearty soup is about 300 calories, yet still very nutritious and health-ful. Collards get a bad reputation. They aren’t pretty, but they are a very nutritious leafy green. 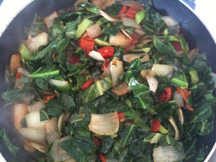 We prepare our Italian Collards with onion, tomatoes, garlic and Italian spices. Please pardon the appearance and enjoy them! Add your own rice, pepper sauce and/or protein to make this side dish a complete meal. This side is about 130 calories. Feel like a dip? If you can handle the intensity, we have our homemade Traditional Hummus ready for you! Served with a stack of zuchinni chips, it makes for a flavorful and healthy snack filled with fiber, protein and joy. Our salads are fresh, seasonal, and diversified with a variety of veggies, protein, fiber and flavor! Featured this week is our Fresh Garden Salad. Available for delivery/pickup on Mondays and Wednesday to ensure freshness! 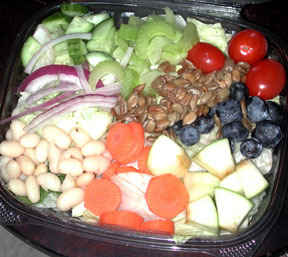 It includes sunflower seeds, red beans, carrots, apples, blueberries, cucumber, celery, tomatos, and red onion. Let’s get ready for some flavor this week! Per request, we are bringing you a broth-based Spicy Sweet Potato Soup. The toasted turmeric, coriander, cumin, and strips of ginger in this Indian-influenced soup has a soothing anti-inflammatory benefit, and its extremely low in fat but big on flavor. About 90 calories/serving. With a soup as lean as that, we can afford to enjoy some Quinoa Pilaf. 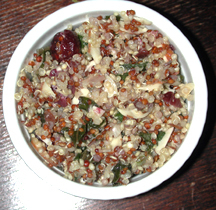 This grain/seed is a complete protein and is flavored with green onions, lots of basil, cranberries, and almonds, in a citrus viniagrette. 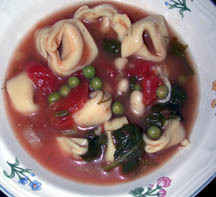 Later in the week, try our wholesome and hearty Tortellini ‘n Kale Soup. It’s filled with love. I’ll keep the calories down, but it has cheese-filled tortellini, peas, and kale. Treat yourself, it’s still less than 250 cals per serving. In honor of the upcoming St. Patricks Day, I decided to bring out the ole cabbage, but give it a twist: Oriental Slaw. It’s raw, with a delicate sesame dressing. 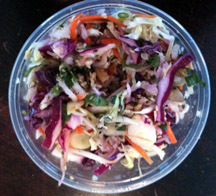 Cabbage is mixed with green onion, carrots, bean sprouts, sesame seeds, and herbs. A nice low-calorie side or snack. Feel like a dip? If you can handle the intensity, we have our homemade Roasted Garlic Hummus ready for you! Served with a stack of celery, it makes for a flavorful and healthy snack filled with fiber, protein and joy. You gotta have it, it’s our Barley Soup w/ Fennel, Dill & Lemon! It has a unique and unbelievable flavor; filled with greens and herbs. A little Feta is provided on the side to blast the flavor to the next level. Less than 200 calories per serving (add 50 cals for the feta). Let’s eat our veggies with this flavorful Sesame Green Beans. Can be served cold or hot, and best when eaten with your fingers. Super low-calorie (less than 70 cals/serving) makes this a sin-less side dish! 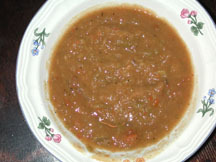 Later in the week, we are cooking up some delicious Green Split Pea w/ HamboneSoup. This will fill you up, please your taste buds and be down-right GOOD for you. We include just a bit of ham to make it homey, but the calories will stay below 130 for this yummy soup. Speaking of home-food. 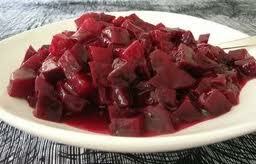 I grew up with Harvard Beets cooked by my grandma for holidays. Since you are family, I’ll share this dish with you. Best served warm, these little jewel-colored roots are simmered with a sweet/clovey sauce. My mouth is watering just thinking about it. Calories are reasonable, trust me. Feel like a dip? If you can handle the spicy, we have our homemade Spicy Hummus ready for you! Served with a stack of celery, it makes for a flavorful and healthy snack filled with fiber, protein and joy. Welcome back, Festive Green Salads! Our salads are fresh, seasonal, and diverified and include a variety or veggies, protein, fiber, fruit and flavor! This week’s salad includes: romaine, sunflower seeds, white beans, carrots, blueberries/apples, cucumber, celery, tomato, red onion, and a home-made basalmic vinaigrette.